“Engineer Dies, Fireman Shot, In Mysterious Train Tragedy.” This was the sensational headline on the front page of the Bisbee, Arizona Daily Review on Saturday July 9, 1921. On July 8, 1921, Southern Pacific engine #745 was making a run over Paisano Pass in western Brewster County in Texas on a regular route to Valentine, Texas with three crewmen aboard, engineer W. F. Bohlman, brakeman Earl Stirman and fireman Charles F. Robinson. They reached the pass, this much is known, but around 5:00 AM, the engine exploded just beyond the mountain peak, the highest point between New Orleans and Los Angeles on the line. The force was enough to dent the rails and cause the boiler to be propelled from the track, but leaving the rest of the train sitting virtually undisturbed. The boiler was thrown 30 feet from the track and the cab was blown 200 feet from the track. Bohlman’s body was located 60 feet away and Robinson was found unconscious with a head injury some four miles from the wreckage. Bohlman had been a Southern Pacific railroad employee for many years and at the time, he was one of the oldest engineers in the company. In addition to his railroad job, he owned a candy store and movie theater/hotel in Sanderson, Texas where he and his family lived. He and Fireman Robinson were reported to be best friends. Authorities discovered what was initially thought to be a bullet wound in Bohlman’s head. Brakeman Stirman said that the approach to Paisano Pass was uncharacteristic in that the train slowed more than it ordinarily would have. As Stirman moved forward on the train to investigate and got within four cars of the cab, he saw a “tall slender man in black” jump from the engine and run away a moment before the explosion. Fireman Charles Robinson was initially arrested following an investigation by the railroad, county authorities and Texas Rangers, but before a trial could take place, Robinson committed suicide. An autopsy revealed a severe brain injury which is thought to have contributed to his anxiety. Brakeman Stirman was also arrested and release twice, but no motive could be found for either crewman’s involvement in a murder, if one was committed. Bohlman’s widow brought a lawsuit against the railroad for $50,000 alleging that the engine was defective. Local undertaker J. J. Kaster’s testimony raised doubt as to Engineer Bohlman’s injury, stating that it could have been debris from the explosion, rather than a bullet wound, that killed him. The actual financial outcome of the conflict is unknown, but records reflect that the first trial resulted in a mistrial and a subsequent trial ended with a hung jury. Bohlman’s widow remained in Sanderson for many years after her husband’s death. Engine #745 (shown above) was repaired in El Paso and returned to service, but to this date, facts of the incident other than stated above are unknown. The mystery of the 1921 train explosion at Paisano Pass remains unsolved. 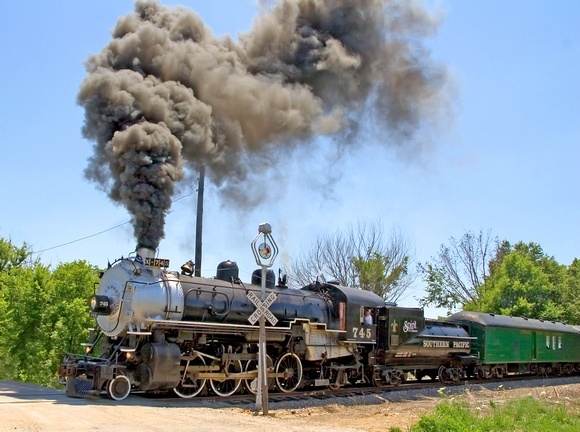 Addendum as of 10/4/15: Old Engine 745 is still going strong at this writing. You have to be approved to join, but it has its own Facebook group. I wanted to thank you for thіѕ excellent read! !